This simple vegetable version of Australia's most-loved Indian dish is ready in minutes. 1. Combine the onion, garlic, ginger, tomato passata, cashews and salt in a blender and blend to a smooth puree. Heat a large saucepan over medium heat and add the butter. Add the puree and cook over medium heat for about 10 minutes, stirring frequently, until it is thick and fragrant. Add the spices and stir well. Add one cup of water and bring to a simmer. Add the sweet potato and simmer for five minutes, then add the carrots and simmer for a further two minutes. 2. Add the cauliflower, beans and peas and simmer for a further five minutes until all the vegetables are softened, adding more water at any stage if necessary. Stir through the cream, taste and adjust for seasoning. Scatter with coriander leaves and serve. 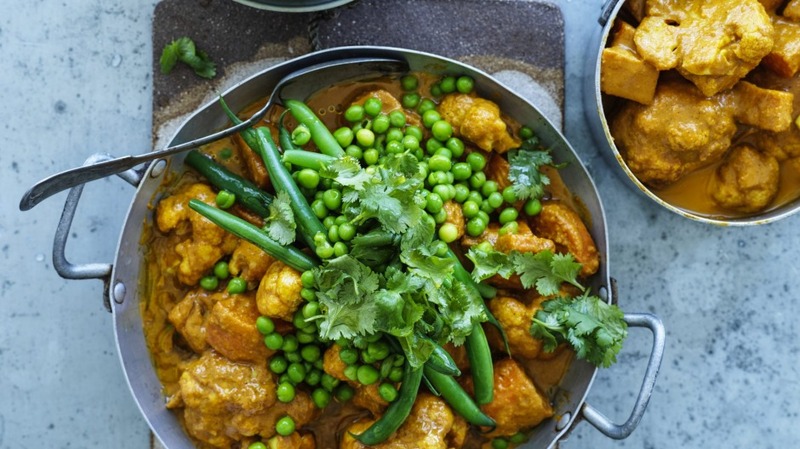 Serve with Adam Liaw's yoghurt naan.